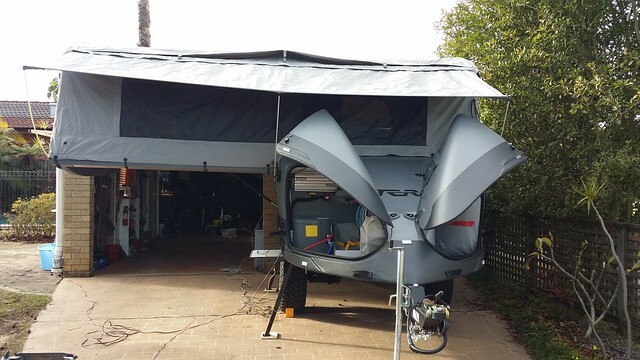 Four very excited campers head out of Sydney just after lunch on Sunday for the first trip in our new Ultimate Xterra Camper Trailer. The preceding 36 hours had been spent playing, packing, seasoning canvas, and getting to know our trailer as much as we could. Originally we had planned to head straight to Crescent Head on Monday, however the decision was made to leave a night early, and spend some a night with our good friends Dave and Kate and kids at Jilliby. As this was only going to be a quick single night stop, we were going to all sleep inside. Lucas would be up on the bed with us, and Ella would sleep on the lounge converted to a single bed. The quick set up was a great success, easily getting everything set up on a dry patch of lawn. We were treated to a beautiful roast dinner before putting the kids to bed and having some adult conversation. Soon enough it was time to snuggle down to the first night in our new camper. The bed was very comfortable, despite having some reservations about the three individual foam mattresses making up the king size bed. You couldn’t feel the joins at all, and, for me, it was very comfortable. Even on a pretty cold night, and waking to a significant frost outside, we were cosy and warm. Ok, I may have flicked the fan heater on at about 5:30am, as I’d forgotten to have my beanie within reach and had a freezing cold head! We’d connected the power, so could use the blow heater that we’d brought with us for the powered site at Crescent Head. So easy to set up and looking awesome! We are happy campers. A fairly cruisy morning followed, giving the canvas some time to dry in the sun before a quick pack up. We’ve been stoked with how easy it is to set up and pack up – certainly ticking all of our boxes in that regard! So our first night in the Xterra was a great success – here’s to many, many more! Thanks, we’d just stopped for fuel when we saw you. Where had you been? We were at Forster for the week. Staying in a unit in Tuncurry. Lauren’s family have a timeshare there so its a chance not to camp in the colder months for pretty much nothing. Camper looks awesome.